A smashing trip that enabled us to get real insight into this fabulous country. Eye opening active tour into the people , culture and sites of Bhutan. If you like mountains, nature and friendly people, go to Bhutan. The tour met my expectations in term of experiencing the cultural aspects for the country. I enjoyed the mix of physical activity with the standard sightseeing. To be honest I was very disappointed with my bhutan experience. .it cost a lot of money and I didn't enjoy at all. Only ground transport Private vehicle, walking. Traveling by road in Bhutan is certainly not what people are used to in Western countries. The roads in the mountains might not be the best but our drivers always keep the safety of the passengers first. Most roads consist of a series of switchbacks going up and back down mountain passes and can be quite bumpy. If you do suffer from motion sickness, we recommend you bring medication for the drives. We use private transport for the duration of this tour. We use private transport for the duration of this tour. 1. CAMERA RULES Please note there may be times during your visit to Bhutan when the use of video and/or still cameras may be inappropriate. Local people may consider that filming is too intrusive and in these circumstances we will request that you do not film. At all times be aware and sensitive to the impact of photography and seek permission before taking photographs of people and respect their wishes if they refuse. If you are still using film for a camera, bring plenty of it - film is often hard to find in Bhutan and can be of inferior quality. 2. CULTURE Accommodation in Bhutan can be very simple. Electricity and water can often be sporadic. All meals are included and almost always buffet-style with plenty of western options. Bhutan, a Buddhist country, believes in ahimsa so the barking of dogs (and there are a lot of them) at night can be annoying. It's advisable to bring earplugs. If you are able to travel with a lot of patience and a good sense of humour, then we know that you - like all of us - will be captivated by what Bhutan has to offer. 3. CLOTHES The prime requirement for clothes you bring on Bhutan trip is that they are comfortable and appropriate to the weather conditions that you are likely to meet. For protection against cold, particularly at night, a number of relatively thin layers is better than a few thick ones. Thermal underclothes, being small and light, can be very useful. Bhutan is very conservative and you should dress accordingly. As a general guideline, shoulders and legs should be covered at all times. The wearing of shorts is not allowed (except while hiking) as it will restrict your entry into buildings of a religious nature and family homes. A water and windproof jacket is useful and a hat and sunscreen essential. Due to the altitude, it can be cold in the mountains even in the summer. 4. FLIGHT Your flights into Paro, Bhutan, must be booked by you online. Please visit the following airline websites to do so: Druk Air http://www.drukair.com.bt/ Bhutan Airlines http://www.bhutanairlines.bt/ Flights can be booked from: Bangkok, Kathmandu, Delhi or Kolkata (please check Visa requirements if flying via India). Once your flight is booked, contact your G Adventures agent, who will be happy to assist in booking your International connections. 5. 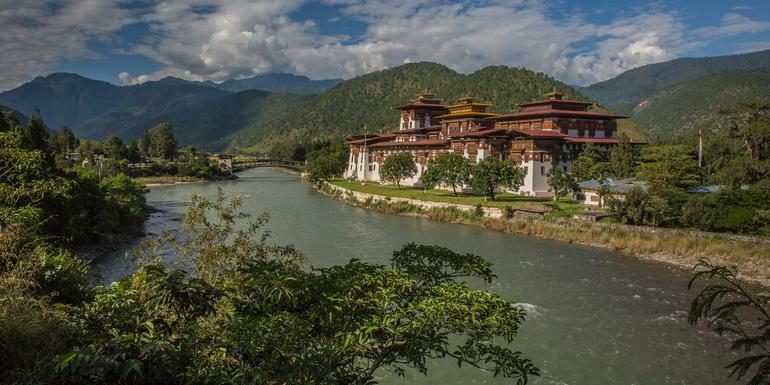 EXTRA NIGHTS If you are planning to extend your stay in Bhutan, pre or post-tour accommodation MUST be booked through G Adventures in order for us to issue a valid visa for the duration of your stay. These extra nights will include a guide and meals in addition to the accommodation.